MONCTON - A New Brunswick historian is lobbying for the "worst and most-hidden secret" in Canadian human rights history to figure prominently in the country's newest national museum. Melynda Jarrett has now delivered what she says is the hidden tale of how war brides and their children have been denied Canadian citizenship, despite living nearly their entire lives in Canada. A panel that will help determine the first exhibits in the Canadian Museum for Human Rights was in Moncton on Thursday in the last stop of a national tour seeking ideas on what should be included. "We would like the story of the denial of citizenship to the lost Canadians and, in particular, the war bride children and the war brides that have been stripped of their citizenship, to be part of the museum exhibits," Jarrett said. "It's an untold story of human rights violations that needs to be exposed. "My role is to explain that (situation) as an embarrassment to Canada's reputation as supposedly a country that respects human rights." 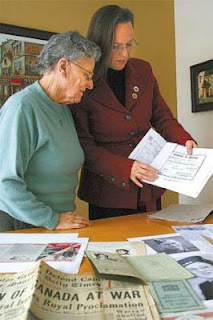 Jarrett, who is also an author and expert on war brides, said there are thousands of war brides and their children that arrived in Canada immediately after the Second World War, prior to the Canadian Citizenship Act of Jan. 1, 1947. As a consequence, some children of war brides were not registered as citizens. Roughly 48,000 young women who met and married Canadian servicemen during the Second World War emigrated to Canada in the years immediately afterwards. Many of their children are just now finding out that they are not registered as citizens as they apply for old age pension. Jarrett said thousands of people are now stuck in limbo as they search for half-a-century-old proof they have been Canadian all along. Many cannot leave the country for fear of not being allowed to return. "This is not to say that the horrible treatment of aboriginal peoples, sexual discrimination, exploitation of children and other human rights issue are not worthy, because they all are," Jarrett said. "But this is another form of virtually unknown discrimination that isn't being heard. "But behind the curtain is this nefarious discrimination occurring against, of all people, the children of Canada's cultural icons, the Canadian war brides." Jarrett was accompanied by Zoe Boone, a Scottish war bride from Aberdeen who came to Canada on a Trans-Canada Airlines flight in 1946 and lives on the Tobique. She was easily granted Canadian citizenship shortly after moving to Canada. "I was a lucky one," she said. "But I'm here to tell the story of those who now weren't." The Canadian Museum for Human Rights has held sessions across Canada over the past year to provide all Canadians with the opportunity to help develop the content of the museum. Located in Winnipeg, the Canadian Museum for Human Rights is Canada's newest national museum with a mission to enhance the understanding of human rights and to promote respect for others. "People often think that museums focus on the past, they are full of artifacts and stories that are complete," said Angela Currie, a spokeswoman for the museum. "This is an ideas museum which looks at the past as well as the present and future of human rights issues that effect Canadians today." Delegations pushing for the museum to include the expulsion of the Acadians, the rights battles of disabled people and language rights issues were also represented Thursday in Moncton. A discussion open to the public was also held Thursday night. Those who missed the sessions can submit their museum ideas online at humanrightsmuseum.ca. The museum will open in 2012, becoming the country's first national museum more than 40 years. "To me, the struggle for Canadian citizenship by people who have always considered themselves Canadian is the worst and most hidden secret of our past and present," Jarrett said. "This can no longer stay hidden."